National Hymn "2600th Anniversary of the Imperial Era"
Ah ichioku no mune wa naru. 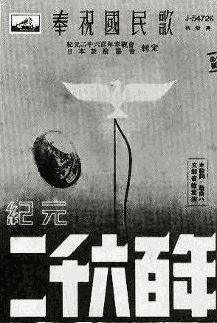 Ah chokoku no kumo aoshi. Ah hokoku no chi wa isamu. Seiki no bunka mata arata. Ah sanran no kono kokui. Chikara to iki wo shimese ima. Ah iyasaka no hi wa noboru. We will celebrate this dawn now! It is 2600th anniversary of the Imperial Era! Ah, hearts of all Japanese subjects bound with joy! According to Japanese myth, the first Emperor Jinmu founded Japan in B.C. 660. Therefore in A.D. 1940 it is the 2600th anniversary of foundation of Japanese Empire. While many songs were made to celebrate it, this song is the most famous one. Japanese myth also says that Golden Kite helped the Emperor Jinmu with the dazzling light. Then Golden Kite became a patriotic symbol.